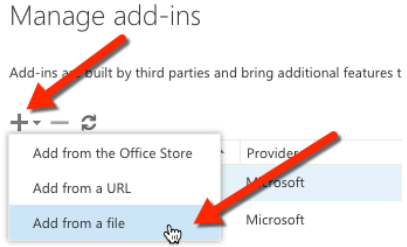 Use sideloading to quickly install an Outlook add-in without having to first put it in an add-in catalog. You can use sideloading to install an Outlook add-in for testing without having to first put it in an add-in catalog. You can also sideload add-ins for other Office suite applications. For more information, see Sideload Office Add-ins for testing. Go to Outlook Web App. Choose the gear icon in the top-right section and select Manage add-ins. On the Manage add-ins page, select the + icon and then select Add from a file. Locate the manifest file for your custom add-in and install it. Accept all prompts during the installation. When that's done, select an existing email and you will see a horizontal bar below the email header that includes the add-in. 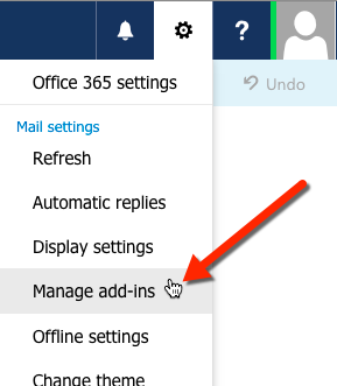 Next, create an email, and then choose the Add-ins (or Apps) menu item to get the task pane to appear. Select the add-in and see it appear in the task pane.